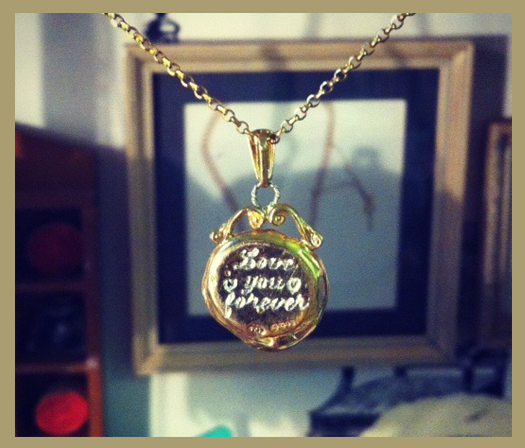 These necklaces are a staple of the 'Love Story, Paris 1946' collection. A hand-stamped, personalised (A-Z) wax seal is suspended from a diamond cut belcher chain, with signature JdL fob detail at the back. One of Jessica's most popular pieces, for both men & women, these wax seal necklaces are the perfect treat for yourself or a loved one. Don't forget to let us know which initial you want on your necklace, by sending us a note during checkout! The seal pendant moves freely along the chain and an additional jump ring is provided 4 inches from the end, to allow you to wear it at a shorter length. Necklaces are made at a total length of 22", with the additional ring at 18", unless requested otherwise. To have this piece made in solid 9ct or 18ct gold, please send us a message. Jessica's jewellery is lovingly handmade to order. Please be aware that it will take a maximum of 3 - 4 weeks for your piece to be created by hand and dispatched within an estimated two weeks. All pieces come beautifully packaged in JdL signature vintage style packaging. If you are shopping for a surprise, please let us know and we can package discreetly. On some occasions we have pieces made for the JdL Jewellery shop. If you are looking for a last minute gift or have a close deadline, email us and we will advise. Please choose your size for rings and bracelets from the drop down menu. If you think you require a smaller or larger size or if you are unsure about your size, please contact the Jewellery Shop. If you need assistance when selecting your ring size please refer to the JdL Ring Sizer as a guide for bracelets and bangles use the JdL Bracelet Size Guide as a guide. If you are using the mobile version of this website, please check your download files for the Size Guides. If you are unsuccesful opening the size guides, see the link to both ring and bracelet size guides at the bottom of our homepage. Most of Jessica's jewellery offers an element of personalisation which transforms your pieces into something unique and special. For engraving enquiries please use the contact form here. At JdL More is More! If you would like to add your own flourish to an existing JdL piece, why not add more seals. Prices are between £67 and £95. For this option simply add a note at checkout and Jessica will contact you. Jessica is well known for her signature hand-stamped wax seals. The seals above offer a guide to the approximate seal size and also their relation to each other. All of Jessica's collections offer a various size of seal, below you will see the sizes that feature within these individual collections. An approximate seal size is also found within the 'Detail' description tab. Please note that as all pieces are individually hand stamped they are therefore unique. Below you will find examples of the plating options available for Jessica's jewellery. If you need any assistance, please contact the JdL Jewellery Shop. 2. Hallmarked Sterling Silver, Polished Finish plated with centre symbol 18ct Yellow Gold. For more photos of Jessica's Jewellery, take a look at Jessica's Jewellery Campaign, 3 Sisters, HERE. Copyright © 2019 JdL Jewellery. Powered by Shopify.